Print design includes brochures, anything sent direct mail, posters, business cards, business collateral (marketing materials), magazines, newsletters, and more. If it is something that is ultimately printed, it's print design. Brochures and Direct Mail come in all sorts of sizes. This is an example of a single folded postcard created for SMU's Lyle School of Engineering. Book design is very similar to brochure design, except there are many more pages. I can design covers as well as the way the content is laid out for literature. To the left you can see a book cover for one of The Infinity Project textbooks. I'm showing it opened and flattened because it was designed so the logo would look continuous when the book was open. Newsletters are a great way to provide news and information to your target market. They can be printed or emailed and really do an entertaining job of getting your message across. I created the newsletters for Haggar Clothing Company. For Haggar, the newsletter was a great way of making the company feel like a family. It would be emailed as a low res PDF to all employees for online viewing. Direct mail and brochures alike can be designed to fold. The direct mail piece shown is a tri-fold design where the outer flaps both fold towards the center. When Eclipse Magazine's art director left Jimmy Porch, the publisher, high and dry, I took over and handled all of the design work for the magazine. Starting in March 2007, the magazine had brand new art direction, and over time, I refined the magazine to a brand new look and feel. Unfortunately, Jimmy decided to move on to a new career after his marriage, and the final issue was the August 2008 issue. Boring business cards aren't even worth contacting a designer to make, so I only design interesting ones. Some of these samples to the left have their information removed to protect privacy. Direct mail is a design category that covers anything that is mailed, whether it is a postcard or brochure. On the left you can see a co-op brochure between Dillards and the clothing brand Multiples. Sometimes brochures sent to different areas of the country are different from others. This particular version was only used in the southeast United States, while alternate versions were used elsewhere. Point of Sale and Point of Purchase are basically two interchangeable terms. They are both categories that cover signs and displays set up in stores. They can be small posters, wallpaper, vinyl stickers on the floor, or even huge elaborate displays. The POP examples to the left are promotions Haggar wanted to run in their stores. Brochures are some of my favorite things to design. This brochure is a booklet style brochure for a degree in Project Management at SMU. 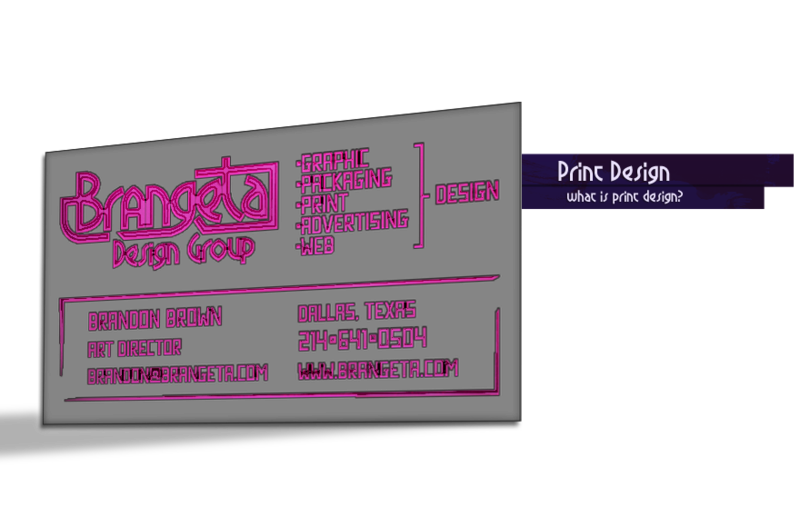 Brandon Brown is a freelance graphic and web designer in Dallas, TX.